Looking for fruit tray ideas? Check this out. I’m using a gigantic doll needle to sew together blueberries for the main cables of this watermelon Golden Gate Bridge. All you need are four ingredients: watermelon, blueberries, pineapple, and kiwi. Looking for fruit tray ideas? 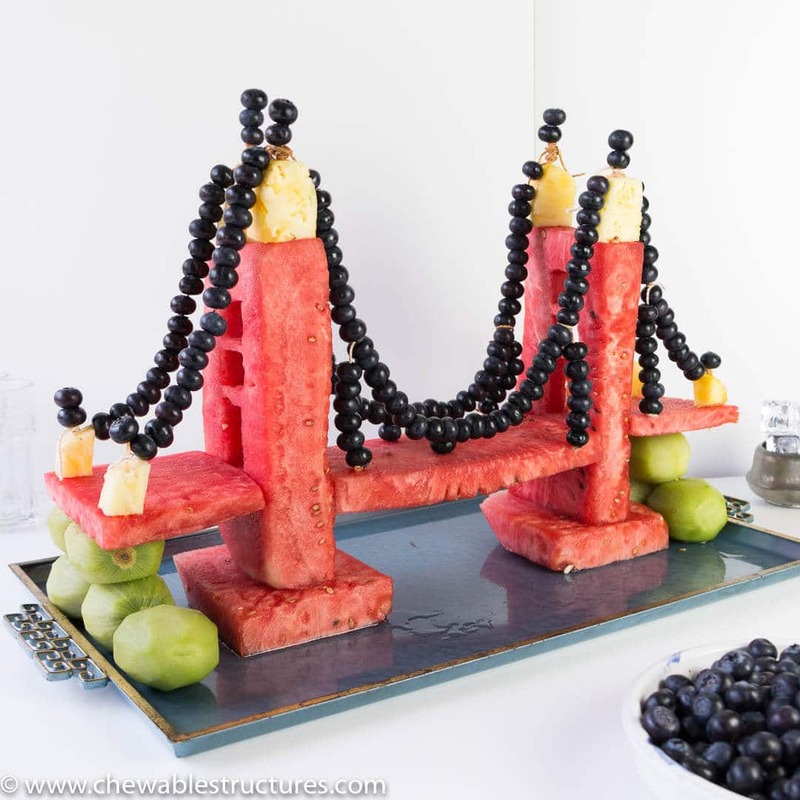 Build this watermelon Golden Gate Bridge by sewing together blueberries! I love building fruit trays for parties. Whether it’s a watermelon fruit train or a watermelon camera with a flip out screen, I love wowing my friends with a creative fruit tray. I tend to incorporate watermelon for the main structure because it’s easy to carve it into fun shapes. I don’t know about you, but slicing through watermelon always makes my home smell like summer time! Plus, this is a fun Golden Gate project for kids and adults! Although I include recipe instructions at the end of this post, it’s better to watch the below video first, because I walk you through each step of assembling this fun watermelon Golden Gate Bridge. WATCH MY RECIPE VIDEO BELOW to see how to make a fruit tray of the Golden Gate Bridge. 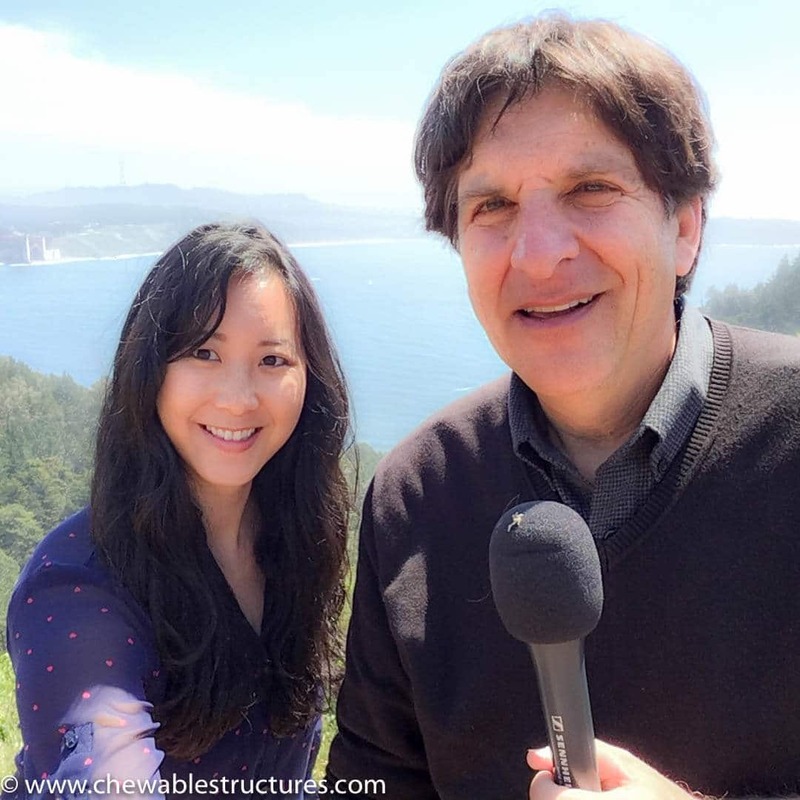 I’m building an edible version of the Golden Gate Bridge because I had so much fun touring around the real bridge with my friend, Jefferson Graham. Make sure to check out Jeff’s website and his amazing YouTube channel, Jefferson Graham Photowalks. Also, watch his video of us looking for the best locations to photograph the bridge. To sew the blueberry cables and suspension ropes, I’m using the largest doll needle in this Dritz 5-Piece Doll Needles Set of Assorted Sizes and cooking twine. To cut out sections in the two watermelon piers, I’m using the large and medium rectangle cookie cutters in this Ateco 4845 Plain Edge Geometric Shapes Set. This is a staple in my kitchen! I love that there are graduated sizes of circles, triangles, diamonds, squares, rectangles, hexagons and octagons. To anchor the blueberry cable to the top of the watermelon towers and to attach the watermelon roadway to the piers, I’m using 10-inch Bamboo Skewers. To anchor the watermelon towers to the watermelon pier and to secure the blueberry cables to the smaller roadways, I’m using toothpicks. Meet my friend, Jefferson Graham. We had a blast filming the Golden Gate Bridge. From Fort Point to Marin Headlands, we saw it all! Check out his YouTube Channel, Jefferson Graham Photowalks. WATCH OUR VIDEO TOUR BELOW of the Golden Gate Bridge. Do you have fun fruit tray ideas that you love making and eating? Leave me a comment below. I’d love to exchange fruit tray ideas with you! I love building fruit trays for parties. Whether it’s a watermelon fruit train or a watermelon camera with a flip out screen, I love wowing my friends with a creative fruit tray. I tend to incorporate watermelon for the main structure because it’s easy to carve it into fun shapes. Plus, slicing through watermelon always makes my home smell like summer time! Watch my fun video tutorial below, because I walk you through each step of assembling the watermelon Golden Gate Bridge. Cut the watermelon into a large rectangle. Use a ruler for accuracy. Then, cut each watermelon section below. Save the remaining watermelon bits for a yummy fruit salad! Watermelon towers: Cut two sections that are 8 inch by 4 inch by 1.5 inch. Use the large and medium sized rectangle cookie cutters (see notes below) to cut out sections in the towers. (Watch my video in step 1 to see the location of each cut out). Watermelon Roadway (Main): Cut one section that is 8 inch by 4 inch by 1 inch. Watermelon Roadway (On The Sides): Cut two sections that are 3 inch by 4 inch by 1 inch. Watermelon Piers: Cut two sections that are 5 inch by 3 inch by 1.5 inch. Blueberry Cables: Cut enough cooking twine so the two middle cables form a U-shape between the two towers. The four end cables are more like a straight line. Leave around 6 inches of extra twine at the end of each cable. You will need this extra twine to tie it to the bamboo skewers or toothpicks. Thread the cooking twine through the doll needle (see notes below). Sew blueberries onto the twine. Blueberry Suspension Ropes: There are four blueberry suspension ropes. Cut enough cooking twine so that each rope suspends vertically from the main U-shaped blueberry cables. Tie two large knots at the end of each rope. Thread the twine through the doll needle and sew blueberries. Kiwi hills: peel the kiwis. 10. Pineapple Supports: Cut 8 pineapple sections that are 1 inch by 1 inch by 0.5 inch. Save the remaining pineapple and make a yummy pina colada! 11. To assemble each section, watch my fun video tutorial in step 1. 1. To sew the blueberry cables and suspension ropes, I’m using the largest doll needle in this Dritz 5-Piece Doll Needles Set of Assorted Sizes and cooking twine. 2. To cut out sections in the two watermelon piers, I’m using the large and medium rectangle cookie cutters in this Ateco 4845 Plain Edge Geometric Shapes Set. This is a staple in my kitchen! I love that there are graduated sizes of circles, triangles, diamonds, squares, rectangles, hexagons and octagons. 3. To anchor the blueberry cable to the top of the watermelon towers and to attach the watermelon roadway to the piers, I’m using 10-inch Bamboo Skewers. 4. To anchor the watermelon towers to the watermelon pier and to secure the blueberry cables to the smaller roadways, I’m using toothpicks. I love this so much!! It’s so cute!!!! Thanks Julie! Fruit is my weakness. It was so much fun to tour the Golden Gate Bridge and then eat a version of it!